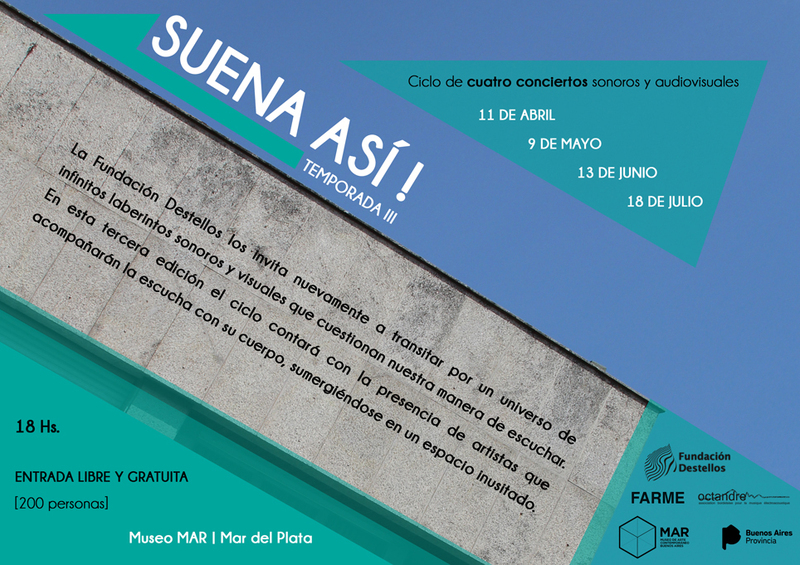 SUENA ASI is a cycle of acousmatic concerts and video music, which will takes place at the Museum of Contemporary Art in Mar del Plata, Argentina,during the months of april, may, june and july, with a program composed of works of the Prize Destellos, members of the foundation, the groupe Octandre of France, de Competition Petites Formes and the members of the Argetine Federation of Electroacoustic music. The Foundation Destellos, call for works for the Twelfth Competition of Electro-acoustic Composition and Visual music. Also, as in former editions, will be granted second prizes, consisting in collections of CD of electroacoustic music offered by: Akusma<Motus, of France Foundation Phonos of Barcelona, Spain. Musiques et Recherches, Belgium, GRM (Groupe de Recherches musicales), France. Likewise, Destellos Network will create the prized pieces into the two years after the competition. 18. The jury has the right to declare the prize deserted and give one or more mentions, also to design an "ex-æquo" prize to works of the same quality level. Foundation Destellos is a non-profit organization devote to promote and develop contemporary arts in its relation with sciences and technologies. If you find that the project is interesting, you can contribute with a donation that will help to develop our activities. Thank you for your collaboration.